Pamper yourself with a seven course gourmet dinner that includes wine, aperitif, and digestif. Catering of small intimate events. Cooking classes in the home followed by a gourmet dinning experience. Friday, October 25th from 6PM-10PM. Cooking class. Learn about and how to make sushi rice, sushi vinegar, pickled ginger, spicy tuna, rolled sushi (Norimaki), inside out roll (Uramaki), Nigiri-zushi/Gunkanmaki, wasabi, vocabulary, cutting techniques and knife skills. Eat and drink to your heart's content. Bring your favorite sharp chef or sushi knife. The Gourmet Spoon - Have Daniel J. Witherspoon create that feast for a special event or teach you to create it yourself. Ice Cream Alchemy - Peter does great work and fun guy (You can trust a thin tri-athlete chef / Alchemist). Nutrition: Lowering Your Cholesterol - Diet or Drugs? AllRefer.com Health Focuses on family and community health - Medical resource provides comprehensive and authorative information and news on diseases, symptoms, tests, surgery, injuries, nutrition, medications, and poisons. Natural Grocers by Vitamin Cottage - somethings available via mail order but best to have one of their stores near you. 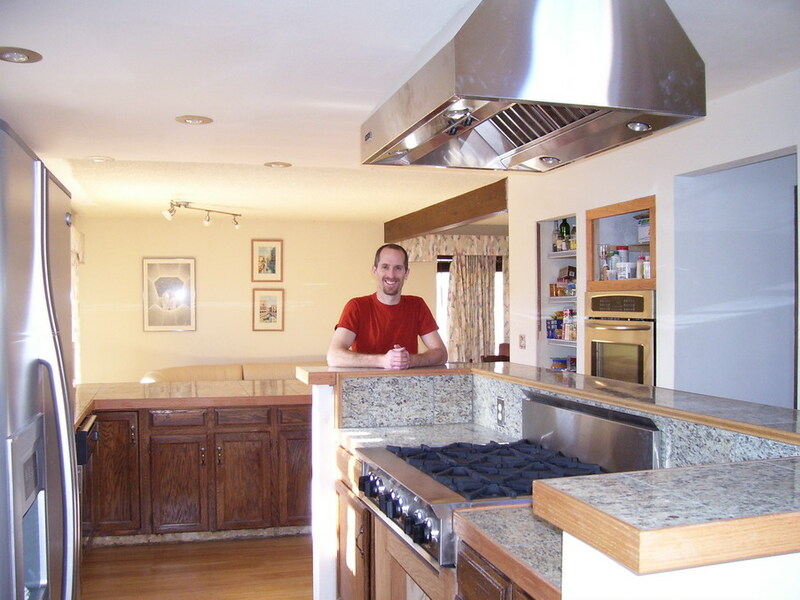 Adam Griff in the finished kitchen he designed and built for his personal and professional use. Contact me for cooking class in the home.